Lots of fun with lots of friends tonight! After yoga, Faith and I headed downtown to meet a group of friends for dinner. We chose Revolutionary Soup because the menu is the bomb and the food is local! 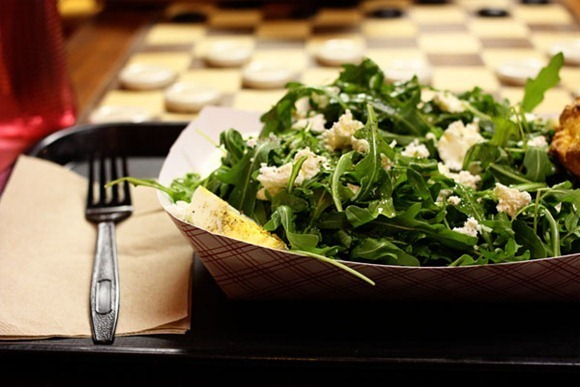 I got a delightful arugula salad with truffle oil, goat cheese, and an ever-so-famous Polyface Farm egg! The salad was plentiful and my craving for egg, satisfied. I also ordered a cornbread muffin on the side, because I like to have bread with meals, and an Honest Tea – love those. After dinner we walked over to Sweet Frog for a treat! After dessert, a few of us headed to The Southern to check out a free concert! 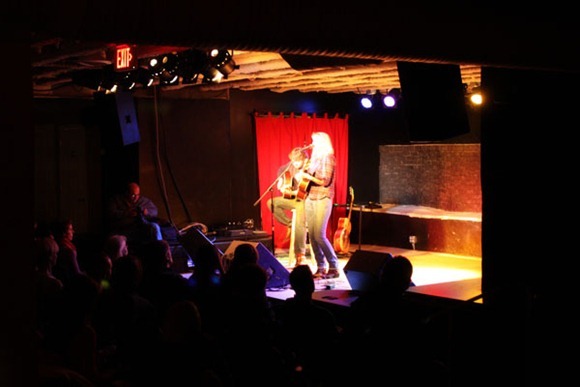 Carleigh Nesbit was the opener, and I really enjoyed her music. She was like the Dixie Chicks minus the chicks with a hint of Jewel. Really really cute song called Kitchen that I loved too! Faith and I walked back to her house, sampled some of her Kefir waters (more on that soon!) and then she drove me home. Thanks Faith! I always crave carbs with light meals like soup and salad. That cornbread looks great! 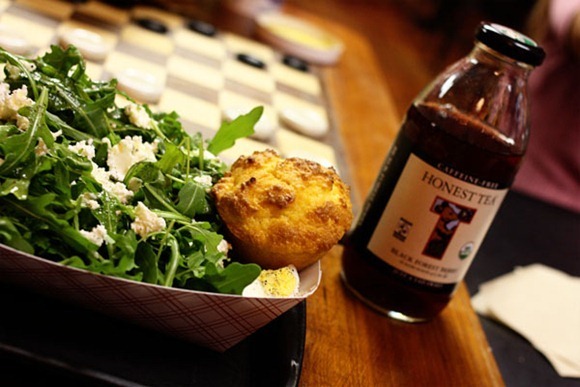 I think the best part of that salad is that corn muffin! Yum. I would choose Lonesome Dove — only because I would love to be lost in a film right now. Fun time! That salad looks like my dream salad. “…for blog worthy color” haha love it 🙂 Sprinkles are too cute and colorful to pass up! 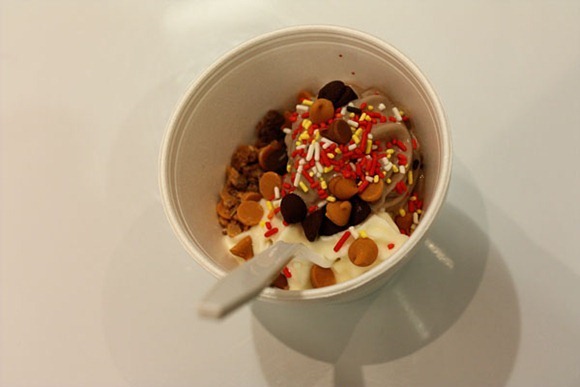 Do you have a Yogurtland near you? They have an amazing red velvet flavor! My vote is for Glee! I used to work at a yogurt shop and we had amazing Red Velvet (and I don’t like red velvet usually). Maybe you just need to try it somewhere else? That’s funny you added sprinkles for “blog worthy color.” I know how that is. Free concert! How fun! Sounds like a great Tuesday! 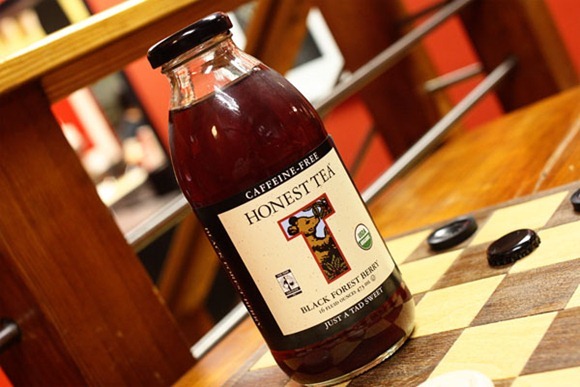 My vote is always for Glee… and Honest Tea! Their mint tea is my favorite. It was a good Glee tonight!! And that salad looks delish. I imagine arugula and goat cheese pairs really well. Sonoma and Napa are about an hour drive north, but very much worth it. Looks like a fun night! It’s awesome that CVille has walkability! I miss that about my old town. Oh I LOVE froyo! I always get original tart with blueberries, kiwi, strawberries, mango, and mochi! It’s the yummiest combo! You have no idea how crazy it is always seeing you talk about Faith. Half the time I read those sentences like “whoa whoa wait I did what? WHEN?? ?” and then realize…it’s a different Faith! haha I’m lame, I know, but I’m not used to other people having my name! Mmm that cornbread is making me hungry for a bread snack. I need to stop reading blogs at night! That salad looks delicious! I may have to recreate that at home as I have almost all the ingredients. I miss Cara! 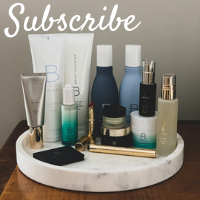 It’s so fun to see her face on your blog every now and then! I’m with everyone else on wanting the cornbread! Yum. So fun to have a night with girlfriends! 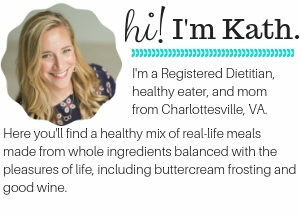 I don’t live in Cville but I wanna be your friend and eat sweet frog with ya! Mmm arugula salads are the best. Sounds like fun…too bad I don’t live in Cville..would love to join you lovely ladies. I love it when bloggers get together!So much fun! What a fun night. I think that’s awesome that you invited locals to be your new friends, how fun. How does Matt eat while away from you? 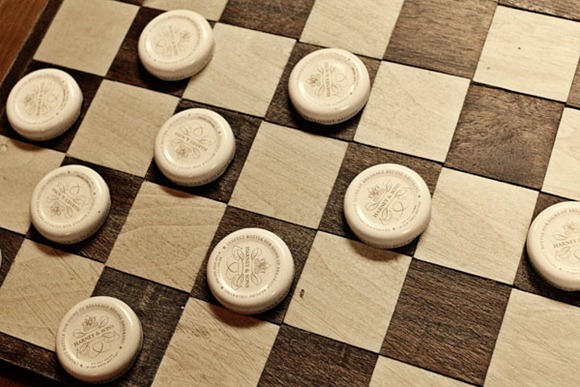 Will he still make the same efforts as you did in the hotel? Or does he just eat out? or eat junk? Or skip meals? Or just eat bread for a meal? Oh, Kath, this makes me wonder. Do you have any suggestions for eating sardines? I love them but am entirely bored of eating them straight from the can on crackers. I have a pretty good sardine salad recipe – and a video to match. I eat them with chips, crackers or as a sandwich. And I think we’ve stirred into spaghetti sauce once! That recipe looks perfect! Exactly what I was looking for to just add some interest to my sardines. Going to make it tomorrow. Yayyyy. I wish I was still in c-ville!!! Let me know if you’re ever in the northern VA area or DC for dinner. Do you use any type of glove or special socks for yoga? Did you make Kefir Water Soda? I just got on a Kefir kick and it’s a little out of control! I just had a muffin as a late night snack. Topped with jam and peanut butter. Everywhere, I’m seeing ice cream and frozen yogurt. The temptation is taking over! I’ve read Lonesome Dove! So good! I was all excited to see a mention of Polyface. I think that might make me really dorky. goat’s cheese salads have the be the best thing ever! i’ve never had cornbread…it looks tasty though. 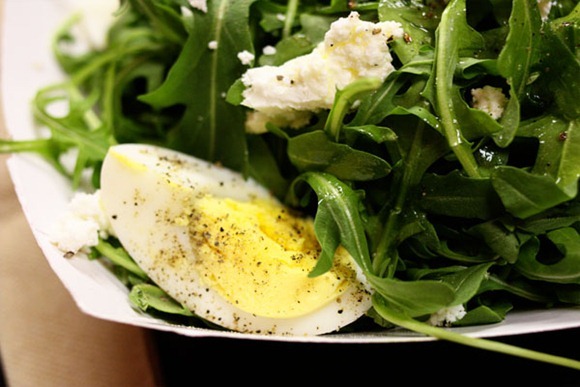 A salad with egg and goat cheese sounds delicious! I love that salad! Do you know where to find the truffle oil? I wonder if WF would have it? I don’t know, but Feast might – aren’t you in Cville? This is my blog browsing time 🙂 For sure! I always like to have carbs on the side of my salads too. I don’t feel satisfied otherwise! What a fun night!!! The frozen yogurt looks so delicious! I wish we had a self-serve frozen yogurt place where I live. The only place we have is TCBY. That is still great but it’s not the same as what I see in a lot of bloggers pictures. 🙂 C-ville looks like such a fun place! I totally need to visit! I wish I lived near you to join in on the fun! I <3 Arugula and that salad looks awesome! I always get caffeine free ones (because I have trouble with too much caf) and my favorites are minty! That corn muffin looks fantastic!! The arugula salad looks awesome! I haven’t had arugula in so long! I may just need to go get some! The Sweet Frog in Carytown just opened! I went and got a mix of cheesecake and red velvet- and the you are right, the red velvet was disappointing 🙁 but the toppings were delish!! Can’t wait to hear about the kefir waters!!! I’ve had Lonesome Dove on my bookshelf for quite some time…It was challenging getting into it at first so I put it away, but I think it’s time to dust it off again. Mannnn oh man I want to come visit Charlottesville!!! It looks like SUCH a neat town!!! So glad you are loving it there. Y’all are seriously so blessed! 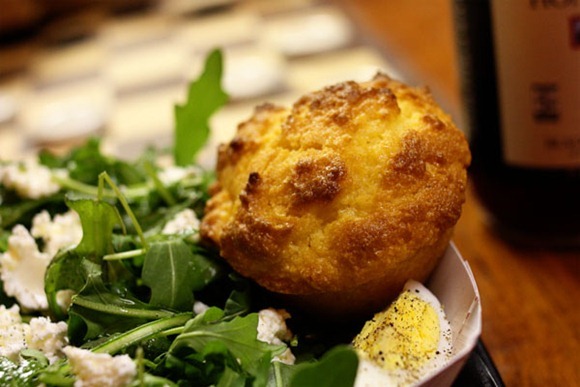 I thought, at first, that your cornbread muffin was a chuck of fried goat cheese, which is REALLY good on salads. ooh pick me pick me! I am in cville, we can be friends! haha “if you want to be our friend for dinners and stuff just email us”…you are too cute and too sweet! I wish I lived closer and actually could! 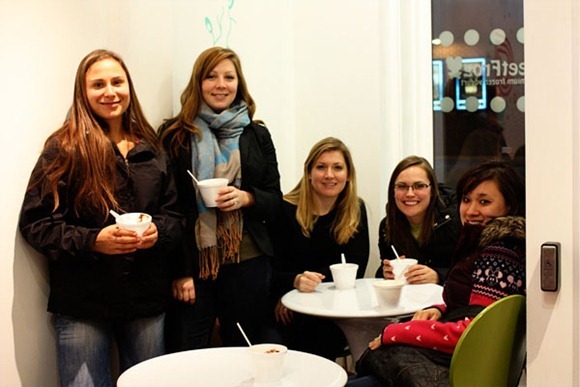 Ditto…I want to be friends and go to KERF fro-yo dates too!